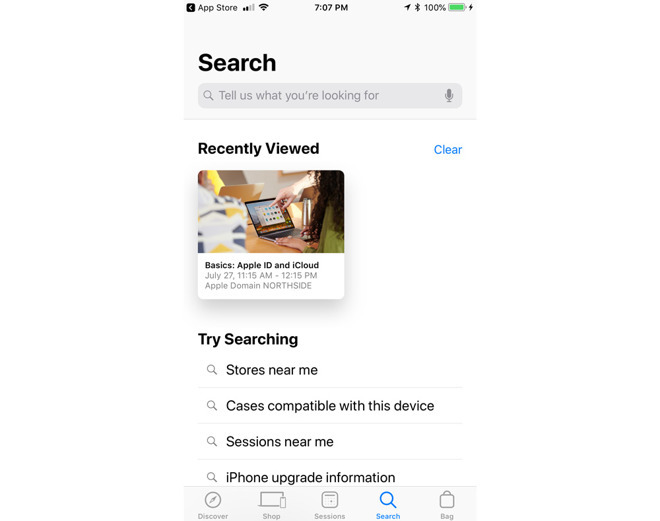 Users can now tap a microphone icon to enter search terms verbally. Typically Apple reserves voice for dictation or Siri. The other addition is search suggestions, giving a better clue as to what the app will respond to, whether via voice or text. Some suggestions may include "stores near me," "sessions near me," and "iPhone upgrade information." The Apple Store app is mainly geared towards shopping, but is also a way of discovering and registering for "Today at Apple" sessions at retail outlets. The company will recommend events based on the devices associated with a person's Apple ID. The app is a free download, and runs on devices with iOS 10 or later.